Gmail too now has a feature which enables emails to expire automatically similar to that of ProtonMail. This is through the Confidential mode that it offers. Login to Gmail and compose a message. From the bottom of the message window, click on the lock/timer icon to access Confidential mode. The time period after which these messages can expire can be set from here. They range from 1 day to 5 years. Choose the required duration from SET EXPIRATION. If you want, passcodes too can be enabled for viewing the messages. Click Save once done. The selected time duration will be displayed indicating that this is a time sensitive message. 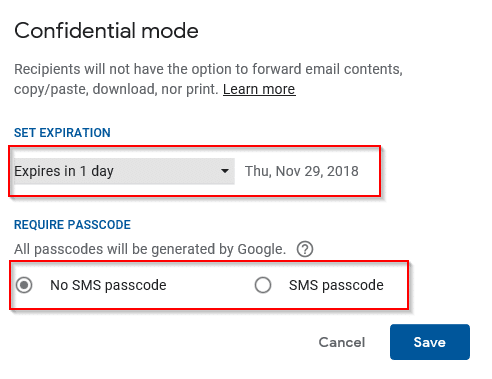 Other cool features when using Gmail‘s Confidential mode is that these emails and their attachments can’t be forwarded, downloaded or copied. Also, the message window will turn blue indicating that the email will be sent using confidential mode. At the recipient’s end, the message will be indicated as sent from Gmail confidential mode. It also won’t be displayed directly, and instead has to be accessed using View the email button. Options of forwarding and printing will also be disabled. This is a useful feature to have when sending time sensitive emails or documents that need quick response.